The beer came first, then a big plate of herbs, another of bean sprouts and a third with sliced chillies and quartered limes; then a tray of condiments: hoi sin and chilli sauces in squeezy bottles, dark soy sauce in a jug and thick chilli paste in a ramekin. Then came the phở: a great steaming bowl of broth extracted from beef bones, ox tail, flank steak, charred onions and ginger, cinnamon, cardamom, star anise and cloves, poured over flat rice noodles and strips of rare beef, and garnished with sliced spring onions. I ate phở often as I travelled through Vietnam, elsewhere in Saigon, in Hoi An – where I learned how to make it – and finally in Hanoi; but it is different and better in the South and best at the phở shop on the corner down the street from my guesthouse. 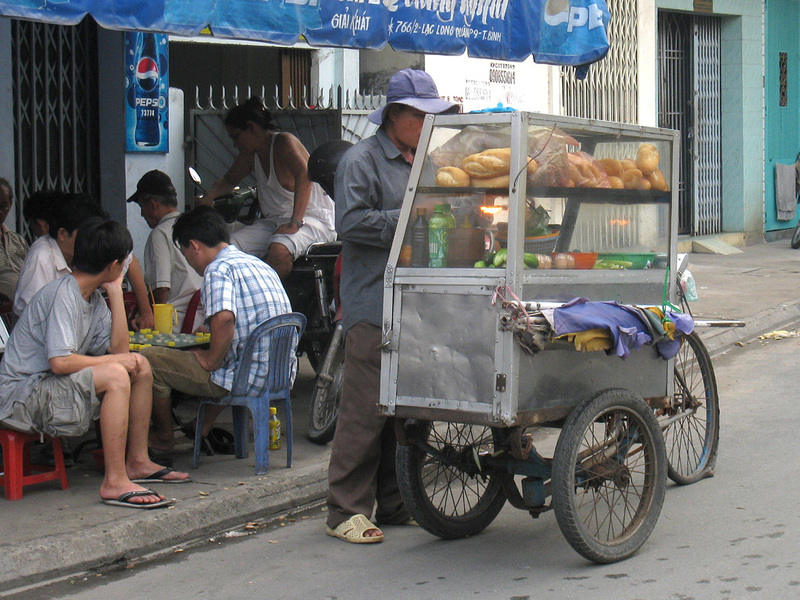 On every other street in Saigon, in the Phạm Ngũ Lão backpacker area, to the north around the museums and to the east in amongst the modern corporate blocks, there are vendors selling bánh mì from carts. They are sandwiches, in essence, French in inspiration, Vietnamese in execution. Take a classic baguette, but made with rice flour and lighter than normal, slather it with mayonnaise and hot chilli sauce, then stuff it with shredded, pickled carrot and daikon, sliced cucumber, coriander leaf and some combination of pâte, roasted belly pork, fromage de tête and Vietnamese sausage. I had bánh mì again and again in Saigon and never got bored of it because each vendor does it differently. If not bánh mì for lunch, then spring rolls. That can mean one of two things in Vietnam, and neither is much like the stodgy, finger-sized snacks served in Anglo-Chinese restaurants. There are gỏi cuốn, or ‘fresh’ spring rolls, with shredded carrot and cucumber, chopped mint, onion flakes and cooked prawns rolled in a moistened rice paper and served as it comes; and there are chả giò, or fried spring rolls, with minced pork, shitake mushrooms, diced carrot and cellophane noodles wrapped in a moistened rice paper and deep-fried to a texture like filo pastry. Both are served with a dipping sauce with lime juice, fish sauce, sugar, chilli and garlic. Noodles soups, rice papers, an abundance of herbs, sharp flavours used judiciously. The menu changes as you travel through Vietnam but the same themes recur: always the same freshness, always the same lightness.